A classic monster adventure film, King Kong breaks new ground in the art of cinematic special effects, and delivers a scream-filled rollicking good rampage. Flamboyant film producer Carl Denham (Robert Armstrong) plucks Ann Darrow (Fay Wray) off the streets of New York City with the promise of stardom, and sets out with his large film crew on a ship packed with guns and explosives across the ocean. The destination is the uncharted and fog-shrouded Skull Island, where legend has it the mysterious creature Kong resides. On the journey first mate Jack Driscoll (Bruce Cabot) falls in love with Ann. Finally arriving at the island, Denham and his crew interrupt an elaborate sacrifice ritual by the native tribe. The locals quickly recognize the value of the exotically blonde Ann, and the tribesmen kidnap her and offer her to Kong. The big ape emerges from the jungle and grabs his prize, but is immediately enamoured by the terrified Ann and protects her from other rampaging dinosaur-era monsters on the island. Meanwhile Denham and Jack have to mount a rescue to try to free Ann and capture Kong. Co-directed by Merian C. Cooper and Ernest B. Schoedsack and produced by David O. Selznick's RKO Pictures, King Kong set a new achievement bar for all monster movies to follow. Combining stop-motion animation, matte paintings, rear projection and miniatures, Cooper and Schoedsack allowed their cast to interact with the prehistoric dangers of Skull Island. 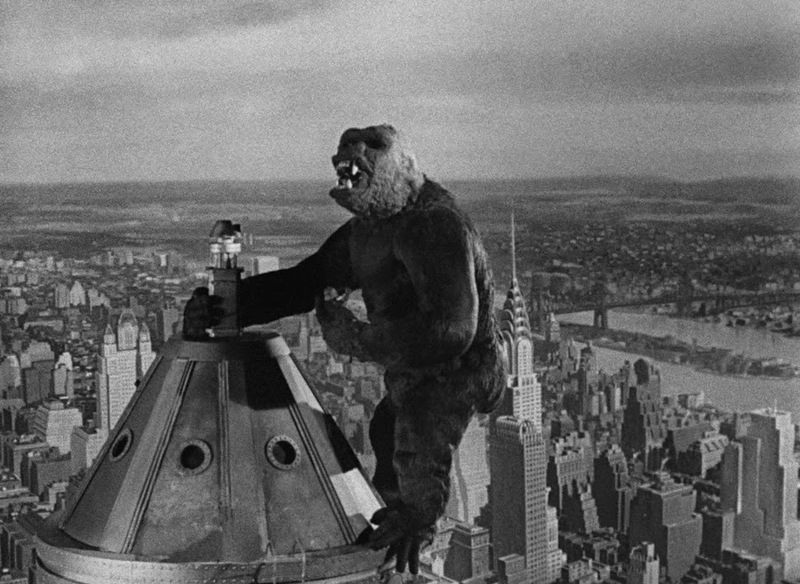 Equally impressive are the scenes back in New York City, where an angry Kong has to battle against the hazards of civilization, with high rises replacing the jagged terrain he is familiar with. The creature effects are simply stunning and perfectly deployed in battles Kong wages with a Tyrannosaurus (this one is a jaw-dropping epic) and then a Pteranodon. Kong's thoughtful actions, reactions and death confirmations in these scenes are breathtaking and painstakingly scripted and executed. Meanwhile a Stegosaurus charges at the humans then a Brontosaurus sinks their boat, and the movie magic at play to combine humans with oversized monsters on the screen re-imagined the art of the possible. Despite all the groundbreaking artistry on display, the film also endures because at its heart King Kong is a story of asymmetrical and unreciprocated love. Kong immediately falls for Ann, and despite her continuous shrieking he claims her as his own and will not allow any harm to come to her. But this being the pre-Code era, the film does not shy away from outright violence. Kong does not hesitate to drop irritating humans to their death from great heights, and in a reference to either ape curiosity or sexual violence, he peels away Ann's clothes and sniffs both the garments and his fingers. By allowing Kong to demonstrate feelings of affection, rampant lust and protectionism towards beauty, the film builds some empathy for the beast, providing an emotional opening to examine Denham's actions. In searching for profit Denham invades Kong's territory and forcibly relocates him. The prisoner breaks his chains of confinement and violently rampages in pursuit of love in foreign surroundings. Intended or not, plenty of parallels can be drawn between Kong's story and the history of slavery. Fay Wray spends most of the movie screaming her head off, and does a fine job of it. King Kong not only reinvented movie special effects, but also demonstrated new boundaries for screaming decibels and frequencies by one actress. Exciting, inventive and unexpectedly passionate, King Kong is a towering cinematic landmark.